When installed in a globe style control valve, TigerTooth trim effectively reduces sound pressure levels up to 30 dBA. TigerTooth trim can also be used to eliminate the damaging effects of cavitation making it an effective choice for either gas or liquid processes with high pressure drop conditions. The basic TigerTooth design involves highly engineered concentric grooves (or teeth) machined into the face and backside of a series of circular stacked discs (called a stack), that also acts as a seat retainer. Legs separate one disc from another, providing the correct distance between individual discs. For easy assembly, the entire stack is tack-welded into one concentric unit and clamped in a conventional globe or angle body valve. With TigerTooth trim, flow passes from the center of the stack through the teeth in a radial, wave-like manner to the outlet, undergoing a series of sudden contractions and expansions. This process reduces fluid pressure in steps without the large, single pressure drop typical of conventional trims. Valtek control valves with TigerTooth trim are manufactured in sizes 1.5 through 36 inch, utilizing conventional Valtek globe style bodies. Both unbalanced and pressure balanced designs are available. 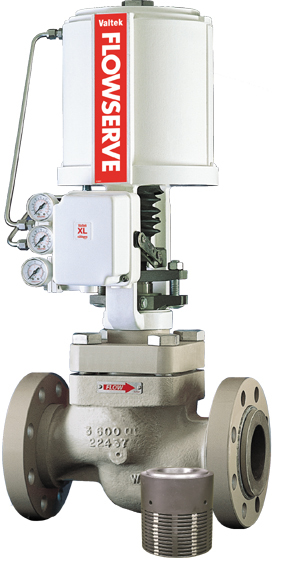 For smaller parts inventory and lower cost, many parts are interchangeable with conventional Valtek Mark One globe valves. To minimize costs associated with large globe valve bodies, valves in sizes 16 through 36 inch may be custom fabricated using an angle body configuration with the inlet at the bottom and the outlet on the side.